2019 Apple Festivals in Michigan - Where, When and More to Find an Apple Festival Near You! Looking for a apple festival in Michigan in 2019? (just scroll down the page)There is no other listing as complete and current as this list, just updated! All the apple festivals in Michigan we can find are listed on this page! If you love strawberries, look for a festival near you below! And I'm always looking for more apple festivals! Please write me, if you know of any to add! I update the dates as soon as the festivals publish their information, but you can always click on the links (usually the name of the festival) to see the current information on the festival's own website. Fenner Nature Center, 2020 E. Mt. Hope Ave. Lansing, MI. Phone: 517-483-4224. Phone: 517-483-4224. Admission: Free Come out to Fenner Nature Center and tempt your taste buds with fresh cider and apple butter being made right before your eyes. Silver Lake Sand Dunes. Email: [email protected]. Phone: (231) 873-2247. Fax: (231) 873-1683.Come enjoy this Fall Festival highlighting the Michigan BBQ, farm fresh apples of Oceana County, and much more. Festival is held in the business district of Silver Lake Sand Dunes located six miles west of US-31 at the Hart/Mears exit 149. Apples and BBQ from the Michigan-sanctioned Kansas City BBQ Cook-off combine with family activities and local sand dune attractions. Rochester Park, MI. Phone: (248) 651-4110. Fax: (248) 651-4757. Email: [email protected]. Held in the scenic 30-acre Rochester Park, located in Downtown Rochester, Michigan. The festival is Michigan's second largest juried fine arts festival and is part of Sunshine Artist Magazine's TOP 35 festivals in the nation! The 43rd annual festival is set for September 5th, 6th, & 7th and includes over 250 fine art exhibitors, a variety of food, live entertainment, and free kids art activities. Belding Applefest - In September, call for this year's dates. Charlevoix, MI. Phone: 231-547-2101. In October, call for this year's dates. A 3-day event held yearly to honor local orchards and growers who, in the spirit of the season, bring the fall harvest to you. More than 30 types of apples, including the hard to find "antique varieties", will be on hand as well as other fall harvest items such as pumpkins, squash, jam, honey and cider. This popular event provides adults and children alike with fun and exciting activities including a craft show featuring 100 craftsmen ready to show their wares. There will be face painting, apple bobbing, a petting zoo, hand-led pony rides and more. Diehl's Orchard, Holly, Michigan. Phone: (248) 634-8981. Fax: (248) 634-0059. Email: [email protected] 1 mile fun run at 8:30am. 4 mile run at 9:00am. We make cider and donuts on site. Craft show until 6:00 pm both days. Downtown Coldwater, Coldwater, MI. Phone: 517-278-5985 . Fax: (517) 278-2947. Email: [email protected]. Annual craft show featuring handmade crafts and collectibles. 100's of apple products featured. The AppleFest and StrawberryFest in Coldwater, Michigan is under a new group..
Fall Harvest Days - September and Oct.
Greenfield Village, Dearborn, MI. Phone: 313-271-1620. Downtown Port Huron, MI. Phone: (810) 985-8843. Fax: (810) 985-9711. Email: [email protected]. A harvest celebration filled with activities for all ages! Enjoy horse and trolley rides, a pie eating contest, a scarecrow contest, and a roller racer obstacle course. Come enjoy free apples and fresh cider at participating stores in historic downtown Port Huron. Niles, MI. We are a four day festival based in Niles, Michigan. Phone: (269) 683-8870. Fax: (269) 687-8843.The festival is one of the top festivals in the State of Michigan. Four Flags Area Apple Festival is on the corner of Lake and 17th Street. We offer Carnival rides, Food vendors, Arts and Crafts on Saturday and Sunday with over 190 booths, Parades, Contests, FREE Entertainment, and Much Much MORE for all to enjoy!!! St. John Fenton Applefest - September 18 -20, 2008 - In September, call for this year's dates. 600 N. Adelaide St. Fenton, MI 48430. Phone: (810) 629-2252 and 810-629-2251. Fax: (810) 735-3071. Email: [email protected]. An event for the entire family with games, rides, food, prizes and more. 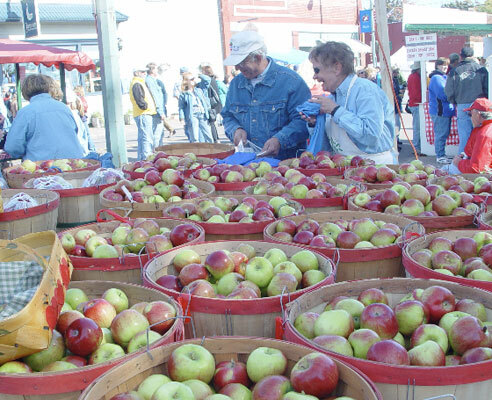 St. Simon Apple Fest - In October, call for this year's dates. 17985 Armada Center Rd, Armada, MI 48005. MICHIGAN'S PREMIER CRAFT CIDER & BEER FESTIVAL. Cider Dayze is a non-profit event put on by the Armada Lions Club, hosted by Blake's Orchard & Cider Mill. They continue to update their site with participating breweries, musicians and vendors so check back soon.